Supermarket's presence in Eunos Crescent threatens livelihood of small business. Wong Chun Han. NTUC FairPrice sets up a new mini-mart in Eunos to the dismay of local shopkeepers. It may be the Christmas festive season, but shopkeeper Mohamed Eliyas has little to cheer about. Run for the last 12 years from a HDB shop unit at Block 6 along Eunos Crescent, the 66-year-old’s convenience store business has never been all that prosperous. It provides a decent livelihood for him and his three workers, nothing more. The recession threatened to end all that. Nonetheless, Eliyas managed to keep the business afloat, albeit only just – despite a rent reduction last year, his monthly takings can barely cover the running costs. Some good tidings would have been welcome this holiday season, yet none are forthcoming. Three weeks ago, NTUC FairPrice – a retail chain with over 90 supermarkets across Singapore – announced its inauspicious arrival to local shopkeepers by commencing renovation work for a new mini-mart. The store, located just 50 metres away from Eliyas’s shop, will greet its first customers next Monday. Eliyas is not alone in his anguish. About seven other shops in the area could face tougher times ahead. An Indian shopkeeper, who preferred to remain anonymous, told The Online Citizen that he could lose up to 50 per cent of his earnings. “In the worst-case scenario, I may have to return the shop [to the HDB],” he said. Setting up small stores in HDB estates is not a new gambit for FairPrice. The supermarket chain currently runs more than 10 mini-marts, having opened its first one in the late 1970s. “Our objective for the Eunos store is to serve the lower income families in the area,” the spokesperson added. 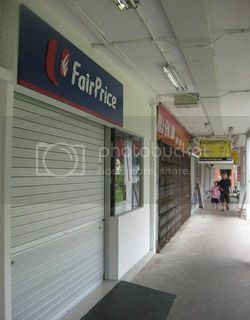 And if FairPrice does honour its claim to make essential items “affordable and accessible”, then local residents would not mind their presence, regardless of the impact on small businesses. Nonetheless, she believes that local shopkeepers need not be overly worried. “[FairPrice] doesn’t always offer the cheapest prices. There will be items that will be less expensive to buy from the other convenience stores,” she said. Even so, shopkeepers are not optimistic about fending off competition from a large commercial rival, given its brand name and superior distribution links. For Eliyas, an Indian Muslim, he can only hope that his range of Indian goods and foodstuff might retain some patrons. The future is similarly bleak for shopkeeper Chua Kia Joo. Now in her eighties, she too faces the prospect of closing her three-decade-old business. But beneath the indignation, she seemed resigned to the inevitable.